For the last few years, a wonderful, breakthrough development has been shaking up the park industry and thrilling park fans. Past-their-prime wooden roller coasters that had become excessively rough have been given a new lease on life. Instead of literally shaking up and disappointing passengers, the reborn coasters are giving them incredibly smooth rides and putting wide grins on them. Using a revolutionary technique, an innovative coaster manufacturer has been ripping out the traditional wooden coaster tracks of the aging rides and replacing them with newfangled steel coaster tracks, thereby creating hybrid wooden and steel roller coasters. The revolution started at Six Flags Over Texas with its legendary, but rough Texas Giant. 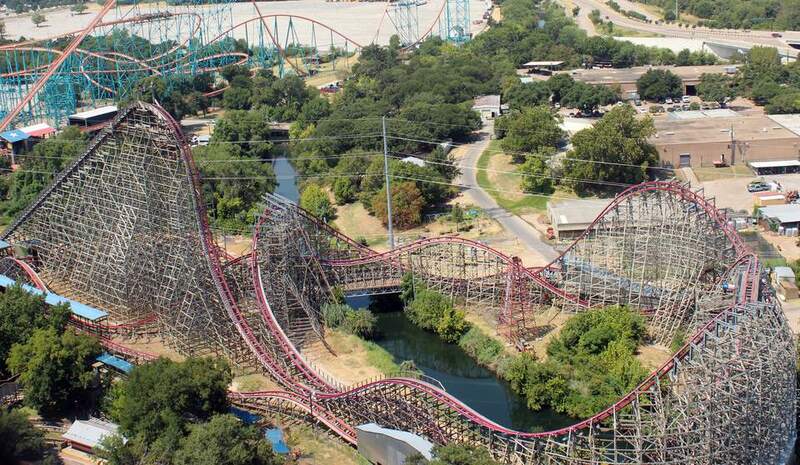 After Six Flags made the transformation in 2011, it dubbed the hybrid coaster New Texas Giant. In 2015, I got to ride the coaster that kicked off the hybrid craze. So how was New Texas Giant? It was everything I thought it would be: delightfully smooth, yet wild, and filled with giant doses of airtime and fun. Approaching the New Texas Giant, you can't miss its most prominent feature: its bright orange track. Known as IBox track (also referred to as Iron Horse), its unique configuration helped convert the once derided coaster into the spectacularly smooth ride it is today. It's neither a wooden coaster track nor a tubular steel one that is used in conventional steel coasters. Instead it is shaped like the letter, "I," with the trains' guide wheels fitting snugly into the channels of the track. Upon entering the station, you'll be wowed by the ride's second most prominent feature: its crazy trains. They are designed like vintage Cadillacs, complete with chrome grills and horn hood ornaments on the lead cars. Inexplicably, the trains also include side windows. In addition to trading out the track, ride manufacturer Rocky Mountain Construction also tweaked the coaster's layout. Emboldened by its rock-solid IBox track, the RMC folks raised the height of the original ride's lift hill by 10 feet to 153 feet. That lengthened the first drop an additional 10 feet to 147 feet. Instead of 53 degrees, RMC reconfigured the first drop to a freaky 79 degrees. All of the tweaking increased the speed 3 mph to a fairly ferocious 65 mph. Clicking and clacking up -- way up -- the lift hill, passengers find a sign at the top. Instead of something traditional such as "No Standing," the sign reads, "Wait! Let's Discuss This!" You have to love the playfulness. The first drop was glorious. Hitting the bottom and rising up, New Texas Giant delivered its first of many pops of airtime. I rode in both the back and the front of the train and found that the seats toward the front offered more pronounced airtime. Regardless of where I sat, the coaster's smooth ride was evident. Instead of the clunky, sometimes jarring wooden coaster experience, the train hugged the track and offered a steady, assured ride. Yet, New Texas Giant managed to retain some of its wooden coaster essence. It truly felt like the combination of a wooden and steel coaster -- which is precisely what it is. After the airtime hill, the coaster entered one of its over-banked turns. And by over-banked, I mean 95 degrees or beyond sideways. Still, no matter what elements they encountered, the train and its passengers remained in control and free from shudder or any herky-jerky sensations. Twisting in and out of itself, the ride offered more glorious airtime and highly banked turns before hitting a mid-course brake run. For its final act, the coaster featured three tunnels, the first of which is identified as "Angus Oil and Gas Shaft." After the disorienting tunnels, the still-ferocious but smooth ride returned to the station. With so many wonderful things to say, you may be wondering why I give New Texas Giant only four stars. Had I reviewed it when it debuted in 2011, I may have been more generous. However, I've had the good fortune of riding both Iron Rattler at Six Flags Fiesta Texas and Twisted Colossus at Six Flags Magic Mountain. Both of the hybrid coasters, which opened after the Six Flags Over Texas ride, owe a debt of gratitude to the original. But in my estimation, they have both surpassed New Texas Giant and knock it down a star. It's easy to see why the trend to transform aging woodies has kicked into high gear throughout the industry. Take one ride on New Texas Giant, and you'll be screaming, "Long live the revolution!"